This is one of the landmark films in Hollywood and Alfred Hitchcock’s first American picture after he was ‘brought over’ by David O Selznick, super producer of Gone with the Wind. Selznick’s deal with Hitch wasn’t exactly RKO’s carte blanche deal with Orson Welles, but it was significant nonetheless considering the tremendous body of work he created in Hollywood, which established an influential legacy of cinema. Like Citizen Kane, Hitchcock's first work in Hollywood is an undisputed masterpiece and his only Best Picture winner. Ironically, it’s also the one picture on his resume with the least amount of cinematic authorship. The fact is, Rebecca is perceived as a Selznick picture in the same way as Gone with the Wind. This perception should not temper the fact that Rebecca is a masterful slice of gothic mystery, a tragic romance and brooding tale of obsession and a terrific film. Maxime De Winter (Olivier) is a widower aristocrat on vacation trying to get his mind off the tragic death of his wife, Rebecca. Joan Fontaine, whose character is unnamed, is introduced as a meek, paid companion to a snobby spinster, Edythe Van Hopper. When Edith finds out the famous Mr. De Winter is also staying at her hotel, she desperately tries to engage him on her level of upper-class snobbery. But it’s the shy naivety of Fontaine that captures De Winter’s attention, so much so that he proposes to her. With his new bride in tow, Maxime returns to his extravagant home, 'Manderley', spoken about in grandiose terms as Xanadu is to Citizen Kane. The new Mrs. De Winter desperately tries to fit into privileged life, but she experiences the toughest opponent in Mrs. Danvers (Anderson), the grumpy housekeeper who idolizes Rebecca’s memory. As clues of the true cause of Rebecca’s death get revealed Maxime’s lustre as an innocent widower comes into question, information which would eventually lead Mrs. De Winter to deceit and corruption in order to save her marriage. Dramatic reveals and story twists come fast and furious once the authorities become involved in superbly melodramatic fashion. It’s a momentum that leads to the fiery finale incited by the now completely deranged and maniacal Mrs. Danvers. Rebecca is as handsome and controlled a film as Hitchcock has ever made. His B&W cinematography (by George Barnes) was never more breathtaking and elegant as it is here. 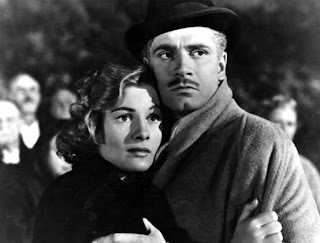 But it’s the evolution of Joan Fontaine’s character that sets the film apart from most of Hitchcock’s other films. Specifically, De Winter’s courtship of Fontaine is particularly delightful, a triumph of the working class over the snobby upper-crust exemplified by Van Hopper. Through the period set in Manderley, the three lead anchors, Olivier, Fontaine and Anderson, give engaging and revelatory performances. Other than the emblazoned finale, Rebecca is without Hitchcock’s familiar set pieces of suspense. But it’s the blanketed tone of mystery that hides the details of Rebecca’s sordid past. And few other filmmakers have made better use of a dead character never seen on screen. Even without the overt supernatural presence of Rebecca, both Danvers and De Winter’s memories of her carry the intrigue and suspense. Rebecca is available on Blu-ray from MGM Home Entertainment.